The challenge was to find the best positions for the iPad and the paper. We experimented and found that an A4 sheet needed to be 13 inches away from the iPad camera and also, the camera is in a corner of the iPad making the iPad quite offset from the paper. 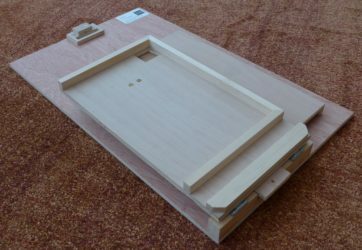 The first idea of having the paper flat and the iPad above it was dismissed because the whole device would be very tall and it would be difficult to see the iPad’s screen. 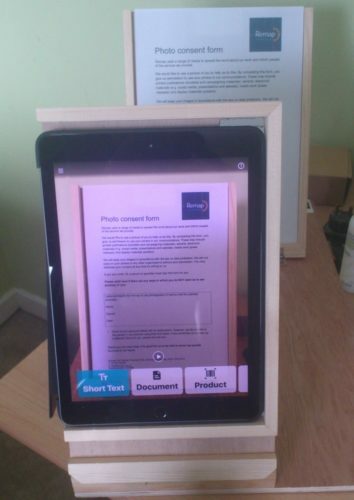 We opted for having the iPad and paper in angled “stands” and this worked out very nicely because the iPad is offset to the left, it made accessing the paper stand easier. A 3D design was done and this automatically worked out the angle for the two stands as about 65 degrees. This seemed very practical for both the iPad and paper, allowing the client to readily access the iPad screen and also angled enough for the paper to stay in the tray. The iPad’s front cover hangs down to the left side of its stand and doesn’t get in the way. The only issue turned out to be accessing the iPad’s on/off button but it could be leaned forward when needed. 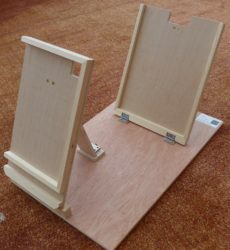 The whole device is designed to fold flat using hinges, these were first included to allow simple adjustments of the angle, especially if a different iPad is used someday. 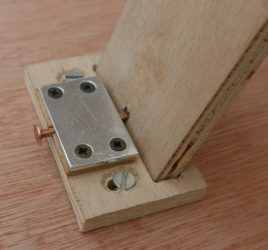 Some simple locking bolts were made so that the stands cannot get knocked over which might result in a damaged iPad. The client was able immediately to read the post that came on the day of delivery. She also wanted to read the cooking instructions on ready meals and was going to experiment with the cardboard wrappers, cut off if necessary.